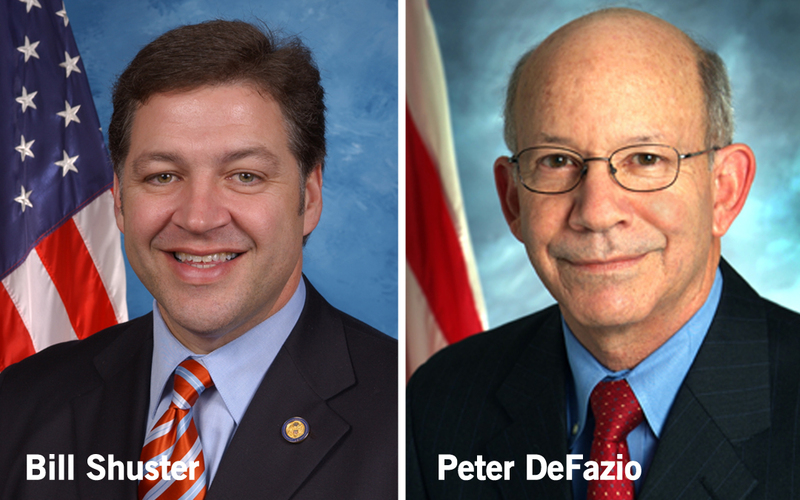 House Transportation & Infrastructure (T&I) Committee Chairman Bill Shuster (R-Pa.) and ranking Democrat Peter DeFazio (D-Ore.) released Oct. 16 proposed legislation to reauthorize the federal highway and public transportation programs for six years. The “Surface Transportation Reauthorization and Reform Act (STRRA) of 2015” would authorize roughly $330 billion in surface transportation investments through Fiscal Year (FY) 2021. The proposal would maintain current highway and transit funding levels, plus annual inflationary adjustments. It does not address the permanent revenue deficit in the Highway Trust Fund (HTF). The T&I Committee is scheduled to consider amendments and presumably approve the STRRA on Oct. 22. The HTF revenue stream is the responsibility of the tax legislation-writing House Ways & Means Committee, while the T&I panel is charged with developing policy reforms and authorizing future investment levels. No multi-year reauthorization bill can move forward without generating new trust fund revenues—or dramatically cutting highway and transit investment—and the Ways & Means Committee has not indicated how it plans to proceed. The T&I bill, however, provides a potential hint of things to come. The measure includes a provision that would prohibit the Secretary of Transportation from distributing funds authorized by the STRRA beyond FY 2018 unless new trust fund revenues are generated. The Senate-passed surface transportation bill would generate enough new revenue to support increased highway and transit investments through FY 2018. While the STRRA is a bipartisan product, Democratic committee staff made it clear to ARTBA and other participants in a briefing session on the bill that they do not support the bill’s investment levels and wanted greater highway and public transportation funding increases. Create a new $750 million per year Nationally Significant Freight and Highway Projects Program that would provide grants to highway, bridge, rail-grade crossing, intermodal and freight rail projects costing more than $100 million. The program would allow up to $500 million to be allocated to freight rail and/or intermodal projects. Accelerate the delivery of surface transportation improvement projects though a number of reforms to the environmental review and approval process. Specifically, the STRRA would: strengthen the abilities of the U.S. Department of Transportation to set schedules and deadlines for other agencies participating in environmental reviews: help eliminate duplication of reviews in the transportation planning and environmental approval processes; and expand and clarify the use of “categorical exclusions”—the lowest level of environmental reviews for transportation projects. Revise the current Surface Transportation Program (STP)—the second largest component of the federal-aid highway program—into a “Surface Transportation Block Grant Program.” The proposal is intended to give state and local governments more flexibility to use federal highway funds by expanding the existing STP to include activities like ferry boat construction, border infrastructure projects, truck parking facilities, recreational trails and others that had received separate funding in prior highway authorization acts. Reduce funding allocated to the Transportation Infrastructure Finance and Innovation Act (TFIA) Program to support credit assistance and loan guarantees from the current $1 billion per year to $200 million annually. Require increased transparency on Highway Trust Fund expenditure through a series of new reports that would show on a semi-annual and annual basis how federal highway funds are used and the benefits that accrue from these investments. The release of the House T&I Committee’s surface transportation proposal is a positive development, and committee approval next week will move the reauthorization one step closer to completion by the end of 2015. It also reinforces the importance of all ARTBA members reaching out to your representative to urge them to support House passage of a multi-year highway/transit bill as soon as possible. ARTBA will distribute a comprehensive analysis of the STRRA in the coming days.